Why do some U.S. cities like Seattle and Boston impose social exactions and sustainability targets on private investment while others like Las Vegas and Houston offer property tax and fee remissions to business, tolerate environmentally hazardous activities such as oil drilling, and express skepticism even about recycling mandates? The behavior of the former cities appears especially puzzling in view of globalization processes that seemingly offer many more options to mobile capital and expose cities’ vulnerability to private investment decisions. Cultural Contradictions examines the paradoxical finding that some U.S. cities can impose burdensome regulations and extract social and environmental contributions from the private sector despite an apparently weak bargaining position. It usescultural change and the growth of non-traditional subcultures to explain why cities adopt these progressive policies. Responding to the urban policy literature’s tendency to prioritize economic considerations over other kinds of causal factors, the book demonstrates the joint impact of culture and economics in encouraging policy outcomes which emphasize social justice, human rights, and environmental sustainability in large U.S. cities. The book makes several specific contributions to urban literature. 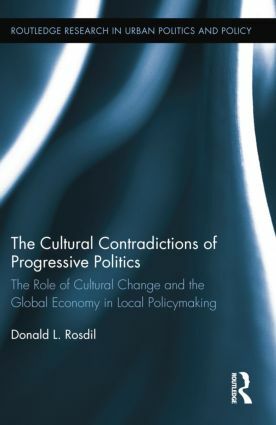 First, it argues that cities in which nontraditional cultural beliefs and practices thrive and which are strongly linked to dynamic economic sectors such as information services, professional, scientific and technical services, financial services, and education and health care services are especially likely to adopt progressive policies. It establishes this claim using both statistical analysis of large-N city samples and a closer investigation of four case studies. Second, it reveals how progressive policies are a plausible response to psychological concerns associated with unconventional ways of life and the nature of postindustrial society. Finally, the book indicates how these new ways of life and postindustrial economic sectors grow in mutually reinforcing ways in order to make these policies acceptable to local economic elites and therefore favorable to the city’s future development. "This wonderful book brings a fresh perspective to urban studies. Connecting cultural understanding to policy decisions about commerce, housing, gay rights, and environmental questions, it thoughtfully probes how transformations to the identity of space, and changes to life-styles and the movements they foster alter the self-consciousness of urban residents and remake political possibilities." "Cogently written and thoroughly researched, this ground-breaking book offers a new paradigm in understanding urban economic development and progressive policy. Rosdil has persuasively identified the conditions under which nontraditional cultural movements shape major city policies." Donald Rosdil is a political scientist who received the M.A. and Ph.D. from the University of Chicago. He has held teaching appointments at DePaul University, Dartmouth College, George Mason University, George Washington University and Towson University. In addition, he was a Visiting Scholar in the Urban Studies and Planning Program at the University of Maryland. Rosdil’s research focuses on cultural and value change in the United States and its impact on urban policy outcomes, especially economic development and environmental sustainability. His work has appeared in Urban Affairs Review, the Journal of Urban Affairs, and Urban Studies.